At least, in the product tanker market, freight rates have been respectable and have been above cash breakeven levels for most of the time in the last three years. What has been amazing though, it’s the rumor mill that Peter Georgiopoulos and General Maritime Corp. may be chasing a fleet of VLCC tankers, possibly the A.P. Møller Maersk VLCC fleet of about twenty supertankers. Maybe also the highflying Navios Group have their sights on these vessels or on another package of the same asset class, but there is at least an official denial by the company in this case. Møller has announced in the recent past that they are interested in divesting of assets and lines of business that do not fit their competitive advantage in the market place (read anything but containerships, terminals and their related businesses), so there might be some truth to the rumor that a quality, modern fleet of supertankers may be up for sale. There has been some activity in the VLCC market recently, after a long permafrost season in this market. Recently, Sinochem purchased four VLCCs from the Clipper Group (all vessels were already on long-term charters to Sinochem), HOSCO divested of two very young VLCCs to European buyers and Mitsui OSK Lines have sold four VLCCs in the spring this year; with the exception of the MOSK Lines fleet that were slightly older than ten years of age, the rest of the tonnage sold so far has been younger than three years of age. Last time such a modern VLCC was sold was in January 2011 when Daewoo sold a (resale) VLCC with her contract in default at about $79 million to Sinokor; as a matter of comparison, HOSCO’s comparable tonnage (at least in age) were transacted at $54 million, a meaningful drop in pricing. The Møller VLCC fleet is about four years old on average, and, individually priced, the vessels should fetch less than $50 million each (at least if recent transactions offer any type of guidance in an admittedly very illiquid market with known problems of ‘price discovery’); so this is a one-billion-dollar deal. Again, so far, so good; one billion dollars would get excited any self respecting investment banker, institutional investor, market consolidator, highflying maritime executive or any executive trying to find his way to the top (again). As life would have it, today John Fredriksen’s flagship company Frontline (ticker: FRO) reported 2013 Q2 earnings. This is a company that routinely posts the best performance in the VLCC market sector, and rightly considered the ‘bell cow’ of the segment. Their earnings report reflected just a very lousy and oversupplied market: while their estimated cash break even is $25,000 per diem, their Q2 earnings averaged just above $14,000 per diem. They also took an asset impairment charge of about $81 million. More importantly, the forward guidance has been bleak based on unfavorable market dynamics and an oversupplied market going forward. For starters, the USA is not anymore a great market for the VLCCs with the shale oil discoveries, and the Chinese prefer their own tonnage for the import needs. And, by the way, while the world VLCC fleet stands at 639 vessels (624 of them are double hull with more than one-third of the world fleet newer than four years old), there are still 57 vessels under contact to be built (just about 9% of the world fleet). Not a bright picture, any way one sees it. 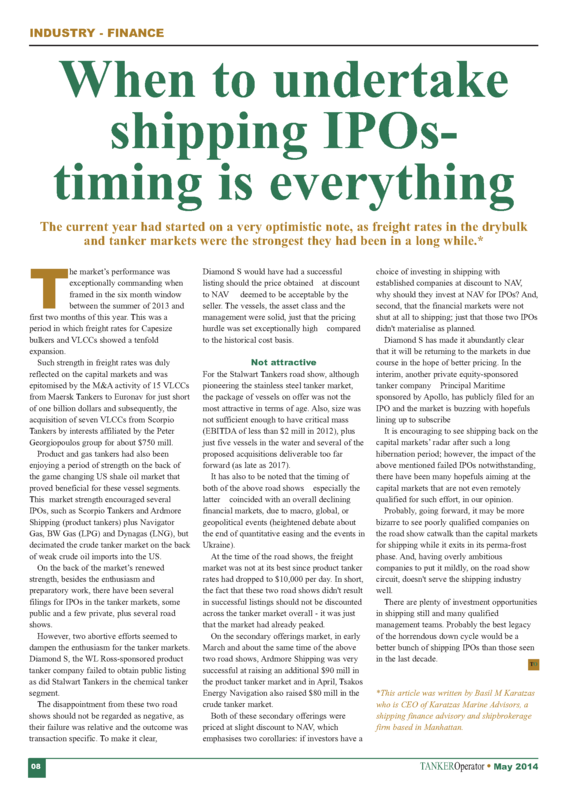 This entry was posted in Shipping Finance and tagged A.P. Møller Maersk, Ardmore Shipping, Basil Karatzas, cash breakeven, Frontline, General Maritime, Karatzas Marine Advisors & Co., Navios, Scorpio Tankers, VLCC on August 28, 2013 by Karatzas Marine Advisors & Co.. Shipping, being an international industry with many service providers necessary to ‘put on a show’, is rather an opaque business by standards long-established in many other industries. It’s not only the potential conflicts of interest and ‘self dealing’ that may be hidden under the cloud of opaqueness, but mainly the fact that many parties in the industry, and for many reasons, use same terminology but different definitions to communicate their message. In the last decade when shipping was hot due to China’s stratospheric growth and comparable freight rate trajectory, many newcomers, especially institutional investors, started looking into shipping primarily through the public equity markets (think ‘shipping IPOs’.) More recently, mostly private equity is also is taking a hard look at shipping and acquiring shipping assets. What we find amazing, to a certain extent, is the way information, especially quantitative information, is conveyed that may make certain companies or operators have an advantage or better performance, when in reality the main difference is that a different denominator is used in each case. When more emphasis was on public equities a few years ago, there was confusion of what were ‘vessel revenue days’ and ‘vessel operating days’, ‘off-hire’ and ‘utilization rate’, numbers that could affect the ‘Time Charter Equivalent’ (TCE) rate and show that some companies were generating more ‘alpha’ from the market. For instance, vessels have to be dry-docked every so often; a shipowner knowing that they have a dry-dock due coming up next year for a vessel, would they count those ten (approximately) dry-docking days as ‘revenue days’? The vessel by law has to be dry-docked and those ten days are ‘lost days’ as far as revenue is concerned, no matter what; but some owners were starting their ‘revenue year’ with 365 days for the vessel while others with ten days fewer. Guess which owner has an advantage and why, as far as ‘performance’ is concerned. More recently, with shipping in turmoil, and a dearth of newbuilding orders (temporarily, at least), shipbuilders had to offer something new, a compelling reason to entice new business in the middle of a deadstill market. How about efficiencies then, namely fuel efficiencies? With bunker prices high, fuel efficiency was a logical card to play. 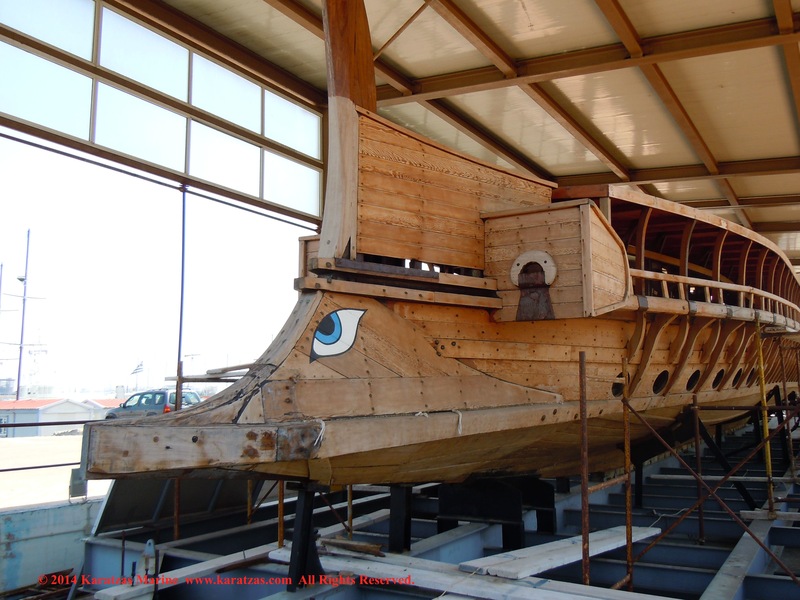 Now, we are not claiming to be naval architects and marine engineers, and also we do not claim that certain yards didn’t work very hard to improve indeed vessel designs. On the other hand, we have seen designs with claims of 30% in fuel efficiency, something that would require a revolution rather than evolution in the science of naval architecture, something that regrettably didn’t happen recently as far as we can tell. But again, some of these efficiencies were due to the fact smaller engines were used to propel the same vessel (definitely lower fuel consumption but at a trade off of under-powering the vessel and increasing the chance of an accident); other efficiencies were calculated at different drafts of the vessel than design draft, assuming certain conditions of trim that were placing limitations on the trade of the vessel, certain (favorable) weather conditions, etc., or the result was based on comparisons against patently outdated designs or poorly maintained vessels. We understand that improvements in fuel efficiency are usually limited at the very best to less than 15% based against previous designs, ceteris paribus. We are not claiming that 15% in fuel savings is a negligible concern, but it’s quite different making an economic decision on whether a company should be undertaking multi-million dollar commitments for newbuildings based on baked information of 30% in fuel savings. Now that passive investors such as private equity funds (passive at least in the form of vessel management) have been looking for third party vessel managers, vessels operators and pool managers, certain definitions have been stretched to the limit. Under pool employment and third party vessel management for instance, the more of the vessel expenses and downtime the pool manager passes back to the vessel owner, the better the pool results, which not only means more profit for the pool manager, but mostly, better pool results to brag about that will be used in presentations to convince more owners to bring vessels under the pool. Repositioning a vessel? It may be an ‘owner’s item’, as far as some pool managers can tell. Ballasting a vessel to a loading port? Also, it could be an ‘owner’s item’. Loss of hire due to vetting and port state control inspections? Ditto. Similarly for technical management, how much of spare parts have to be kept onboard the vessel? Is it an expense or an investment? How about the cost when a minor part is missing and the charterer places the vessel off-hire and refuses to pay freight for the downtime? How about the reputation and goodwill a vessel and her owner create with the chartering community by providing well equipped and maintained vessels? How about the higher demand and potentially higher price the vessel will obtain in the secondary market later on with the vessel coming for sale from a ‘good stable’, as the shipping lingo goes? It’s the holy grail of business gurus, business schools and management experts reaching for optimization; not to mention the genuine goal of many good companies and managers. And, no doubt, there will always be debated among bean-counters whether certain business cash ‘outflows’ are expenses or investments / capital improvements. After all, that’s the ‘nature of the beast’. On the other hand, there should be a certain amount of transparency on how certain numbers are achieved by the companies, the managers, the pool operators, etc But more importantly, parties receiving such information should look diligently ‘under the hood’ and demand a thorough explanation on how the numbers are defined. Just because one manager is ‘cheaper’ than another, or one pool is ‘better performing’ than another, etc is immaterial unless a common denominator can be established. As they say, the devil is in the details, and sometimes such details can offer surprises. This entry was posted in Shipping Finance and tagged Basil M Karatzas, commercial management, Karatzas Marine Advisors & Co., pool employment, pool performance, private equity, shipping finance, technical management, vessel operating days, vessel operating expenses, vessel revenue days on August 26, 2013 by Karatzas Marine Advisors & Co.. The prolonged trough of the shipping industry has drawn the attention of many newcomers to the industry, from distressed instrument investors to third-party vessel managers and operators. It’s not only that all these newcomers (along with existing players) position themselves for a market recovery; a sea change has taking place in the shipping industry, from shifts in shipping finance to competition from more fuel efficient newbuilding designs to geo-political issues such as China’s support of domestic shipbuilders and their fostering of a local shipping industry that create business and investment opportunities. Among the participants in the shipping world, traditional shipping finance, and namely the shipping banks, like a modern day Aeolus – the Greek god of winds – have the power, whether actively or passively, to shift the market at will. With an outstanding shipping loan portfolio of more than $500 billion at the top of the market, at present, shipping banks have been trying to find their balance while having one eye on the rear view mirror and their ‘legacy issues’ (shipping, but also sub-prime, real estate, sovereign bonds, etc) and the other eye on Basel III and the new capital requirements. Recently, the private equity firm KKR announced the formation of the Maritime Finance Company with the funding of a few hundred million dollars for the purpose of primarily filling the gap left by the lack of capacity from the traditional shipping banks. The concept of institutional investors with private equity minded returns entering the debt financing market in shipping is not exactly unique. Based on our experience and dealing with small banks and seasoned shipping bankers, the concept has been around at least for the last two years and we are aware of institutional investors providing small funding to boutique shipping banks for origination of new loans for double-digit returns (returns on the equity investment, not necessarily double digit interest rates). No doubt that such debt financing cannot be replicated on a massive scale given the cost of financing. On the other hand, it has been calculated, that for banks to fully comply with Basel III capital requirements, their spread on shipping loans will have to be more than 600 basis points. If one were to calculate the total cost of debt financing on a historical average of LIBOR, that numbers would not be much lower than 10%. Probably in the near term of the next two years it will be difficult to deploy large amount of capital as debt financing for new projects while charging interest rates high enough to generate double digit returns. After all, current undertakers of new projects in shipping usually have their financing in place and access to different and cost competitive forms of capital from many geographic markets (such as export credit, Norwegian bond markets, highest priority receiving debt financing from shipping banks to the extent possible, etc). On the other hand, there are still plenty of ‘legacy projects’ with banks and shipowners from the better days of the cycle, projects that are not completely doomed but definitely could utilize some restructuring and some capital injection, not exactly equity but neither debt, mostly around the ‘mezz’ section of the capital structure, that could deliver low double-digit returns with low risk while bypassing most of the ‘issues’ an institutional passive investors loves to hate in shipping. This entry was posted in Shipping Finance and tagged Basel III, Basil M Karatzas, debt finance, Karatzas Marine Advisors & Co., KKR, mortgage defaults, private equity, shipping banks, shipping loans on August 23, 2013 by Karatzas Marine Advisors & Co.. 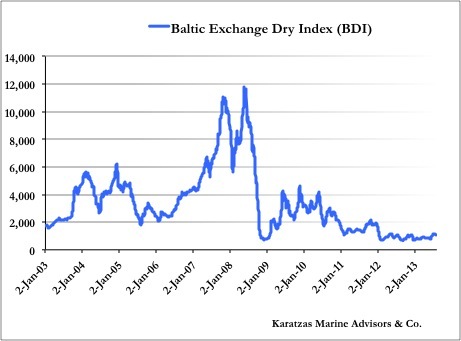 Ever since the Baltic Dry Index (BDI) took a vertical dive from the top of ca. 12,000 points at the end of May 2008 to the well below 1,000 in a matter of seven short months and its sideways movement ever since around the 1,000 mark, lots of resources have been expended on the market recovery and the best strategy to exploit such recovery. Such drastic change in the index, and by default in freight rates and shipping asset prices, caught the attention of not only the typical market players like shipowners and the shipping banks, but also the attention from players and investors outside the industry such as institutional investors and private equity funds who never before analyzed the shipping industry seriously. While the highly-wished vessel auctions on industrial scale and sale of distressed assets never materialized in any meaningful way, at least on a scale to satisfy the multi-billion appetite of private equity funds, few projects took place at market related pricing; but still, there are billions and billions and billions of dollars that are on the sidelines or have been committed to be invested in shipping assets; the success rate of converting funds to investments has been disappointing, which begs the question: if there are funds and a tremendous appetite to invest in the shipping industry, and shipping is going though one of its worst troughs ever, what is holding back the investment process? Unlike other asset-heavy and capital intense industries, shipping is rather fragmented and opaque and based on operational expertise and niche industry knowledge; the execution risk of actually investing in ‘cheap ships’ is tremendous, since buying a vessel is only the first step of crucial decisions: who will be the commercial manager and what will be the vessel employment strategy, how do you select a manager and a partner in shipping, who will be the technical manager of the vessel, how one qualifies such a manager when maintenance standards vary widely across asset classes and local markets, how one evaluates the credit worthiness of a private charterer based across the globe, etc. The execution risk of actually investing in shipping is tremendous; one could be 100% correct on the asset class to invest in and get a great price by buying a vessel at a rock-bottom price, but still there many ways one can lose money on the actual execution. So, what gives? Reputable publicly traded companies may provide an alternative platform for investing in shipping by taking out of the investment all operational risk; a competent management can take a lot of the guesswork out of selecting asset classes, and prices, and managers, and commercial strategies. Plus, they have the added advantage that they provide a platform with plenty of liquidity. A notable example in 2013 of a shipping company that has convinced Wall Street that can properly manage execution risk is Scorpio Tankers (STNG) by coming up with a business model based on ‘eco design’ products tankers at competitive asset pricing based on their first mover advantage in the market that has been experiencing positive structural changes; year-to-date in 2013, Scorpio raised in four attempts about US$ 950 million in the public equity markets and an oversubscribed debt commitment of US$ 520 million. Although we are aware of several private equity funds having raised or committed hundreds of millions to be invested in shipping assets, we have not seen any of them deploying funds so easily or convincingly. In our experience working with funds and institutional investors, the fact that Scorpio is taking the sting of the operational risk away is a great investment catalyst. This entry was posted in Shipping Finance and tagged Basil Karatzas, Basil M Karatzas, execution risk, Karatzas Marine Advisors & Co., private equity, Scorpio Tankers, shipping, shipping finance on August 7, 2013 by Karatzas Marine Advisors & Co..